In the newest iterations of plans to redraw Kern High School District boundaries, no trustees are drawn out of their areas — and that’s fine by them. At least three trustees voiced support for the newest plan introduced this month, which allowed sitting trustees to remain in their areas, despite drawing ire from community groups hungry for change and greater representation from their neighborhoods. Past proposed plans have taken aim at Area Three Trustee Joey O’Connell, whose district spans from some of the highest income areas of southwest Bakersfield — which he calls home — into Kern County’s poorest agricultural communities. But the plan introduced this month allows O’Connell to remain in his district. KHSD Trustee President Phillip Peters said the new plan made “reasonable changes;” Trustee Jeff Flores agreed; and Trustee Bryan Batey threw in his support for the plan. “I’d like to … voice my support for your most recent plan, primarily because it’s in compliance with the Luna case that has been driving a lot of this discussion,” Batey said, referring to a lawsuit the Kern County Board of Supervisors lost this year alleging supervisor areas were gerrymandered to break up Latino communities of interest and dilute voter strength. KHSD trustees voted to preemptively begin redrawing their own district lines just days after a federal judge determined Kern County had violated the law. They were also acting under threat of a lawsuit the Dolores Huerta Foundation planned to file challenging their trustee boundaries under the 1965 U.S. Voting Rights Act. The Dolores Huerta Foundation submitted proposed maps to be considered by KHSD trustees that created two majority-Latino districts that kept communities of interest intact, however Shelly Lapkoff, a demographer contracted by KHSD, found faults. 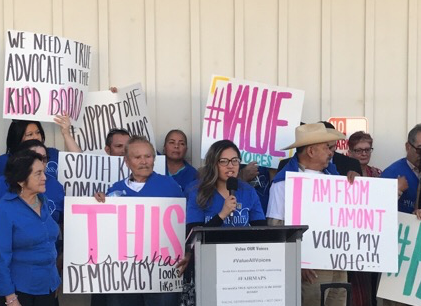 The maps are not consistent with the Luna decision to unite historical farmworking communities of interest, including Arvin and Shafter, into one trustee area, she said. The shapes of the boundaries do not follow recognizable streets or geographical features, and the proposed DHF maps place three incumbents into one district, Lapkoff pointed out. Those three incumbents live within two-miles of each other in west Bakersfield. More than a dozen people spoke in favor of the DHF-proposed maps May 7. Meanwhile, Mathew Ross, the superintendent of the Vineland School District in Weedpatch, told board members he had “deep concerns” with the proposed KHSD plans, and accused trustees of favoring boundaries that maintained a status quo of incumbency. However, not everyone at the meeting was in favor of the DHF proposed maps and the redistricting process. Bryan Colebrook, a parent and an occasional local conservative talk radio show host, said that he is against the redistricting process because it draws maps based on race and ethnicity. ‘[The race of the Trustee] should not matter because I believe we are all American first and foremost. The [1965 U.S. Voting Rights Act] was passed to prohibit consideration of race and ethnicity. The DHF maps are based on race and ethnicity. It used to be open elections, but the board changed to trustee areas to increase the chances of having Latino representation. It is wrong to draw maps based on race and ethnicity,” Colebrook said. Many of the community members and parents who have spoken at the redistricting meetings have been residents from Lamont who are hoping that the redistricting process will give their community representation it needs on the board to advocate for a high school in Lamont. Residents there must currently bus to Arvin High School. The Kern High School District Board of Trustees will decide on the new trustee area boundaries for the district Monday.